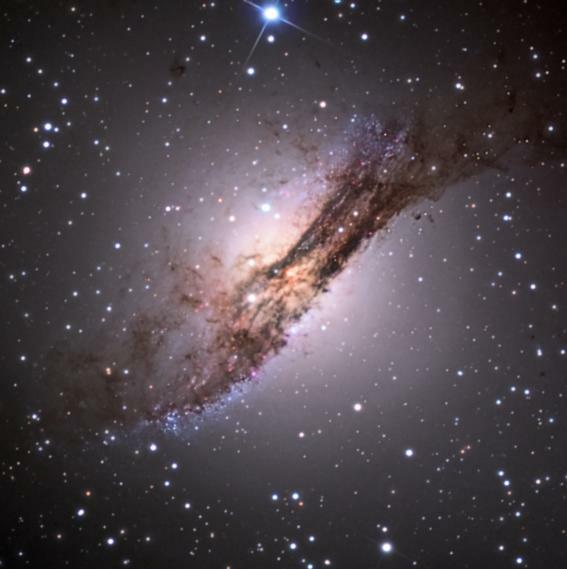 NGC 5128, a lenticular galaxy, is about 14 million lightyears distant in the constellation Centaurus, and about 4 degrees north of the great globular cluster, Omega Centauri. A relativistic jet, moving as fast as half light speed, shoots energy from the active nucleus of this "radio" galaxy, accounting for the emissions in the radio (as well as X-ray) wavelengths. Numerous small bright blue stars, the product of shocked gases, are evident in the NE radio lobe of this galaxy. The older stars of the galaxy are distributed much more widely than this somewhat tight grouping of younger blue stars. Centaurus A is the 5th brightest galaxy in the sky, though best visible only from the southern hemisphere.